Published: Jan. 22, 2019 at 03:05 p.m.
Take an inside look at how the Super Bowl LIII game balls are made at the Wilson Sporting Goods Co. in Ada, Ohio. Katie Long lines up an official football for the NFL Super Bowl LIII game to be stamped with team names at the Wilson Sporting Goods Co. in Ada, Ohio, Monday, Jan. 21, 2019. The Los Angeles Rams will play the New England Patriots in Super Bowl LIII on Feb. 3 in Atlanta. Loyd Conley cuts panels for an official football for the NFL Super Bowl LIII game at the Wilson Sporting Goods Co. in Ada, Ohio, Monday, Jan. 21, 2019. The Los Angeles Rams will play the New England Patriots in Super Bowl LIII on Feb. 3, in Atlanta. Official footballs for the NFL Super Bowl LIII game wait to be finished at the Wilson Sporting Goods Co. in Ada, Ohio, Monday, Jan. 21, 2019. The Los Angeles Rams will play the New England Patriots in Super Bowl LIII on Feb. 3 in Atlanta. Jim Gatchell turns an official football for the NFL Super Bowl LIII game right side out after steaming it at the Wilson Sporting Goods Co. in Ada, Ohio, Monday, Jan. 21, 2019. The Los Angeles Rams will play the New England Patriots in Super Bowl LIII on Feb. 3 in Atlanta. Donna Conley laces an official football for the NFL Super Bowl LIII game at the Wilson Sporting Goods Co. in Ada, Ohio, Monday, Jan. 21, 2019. The Los Angeles Rams will play the New England Patriots in Super Bowl LIII on Feb. 3, in Atlanta. Donna Conley laces an official football for the NFL Super Bowl LIII game at the Wilson Sporting Goods Co. in Ada, Ohio, Monday, Jan. 21, 2019. The Los Angeles Rams will play the New England Patriots in Super Bowl LIII on Feb. 3 in Atlanta. Official footballs for the NFL Super Bowl LIII game wait in a bin to be finished at the Wilson Sporting Goods Co. in Ada, Ohio, Monday, Jan. 21, 2019. The Los Angeles Rams will play the New England Patriots in Super Bowl LIII on Feb. 3 in Atlanta. Deb Ellis inflates an official football for the NFL Super Bowl LIII game at the Wilson Sporting Goods Co. in Ada, Ohio, Monday, Jan. 21, 2019. The Los Angeles Rams will play the New England Patriots in Super Bowl LIII on Feb. 3 in Atlanta. Deb Ellis tosses an official football for the NFL Super Bowl LIII game into a bin to await final inspection at the Wilson Sporting Goods Co. in Ada, Ohio, Monday, Jan. 21, 2019. The Los Angeles Rams will play the New England Patriots in Super Bowl LIII on Feb. 3 in Atlanta. Official balls for the NFL Super Bowl LIII football game wait to be finished at the Wilson Sporting Goods Co. in Ada, Ohio, Monday, Jan. 21, 2019. The Los Angeles Rams will play the New England Patriots in Super Bowl LIII on Feb. 3 in Atlanta. Katie Long sews the panels of an official ball for the NFL Super Bowl LIII football game at the Wilson Sporting Goods Co. in Ada, Ohio, Monday, Jan. 21, 2019. The Los Angeles Rams will play the New England Patriots in Super Bowl LIII on Feb. 3, in Atlanta. Katie Long sews the panels of an official football for the NFL Super Bowl LIII game at the Wilson Sporting Goods Co. in Ada, Ohio, Monday, Jan. 21, 2019. 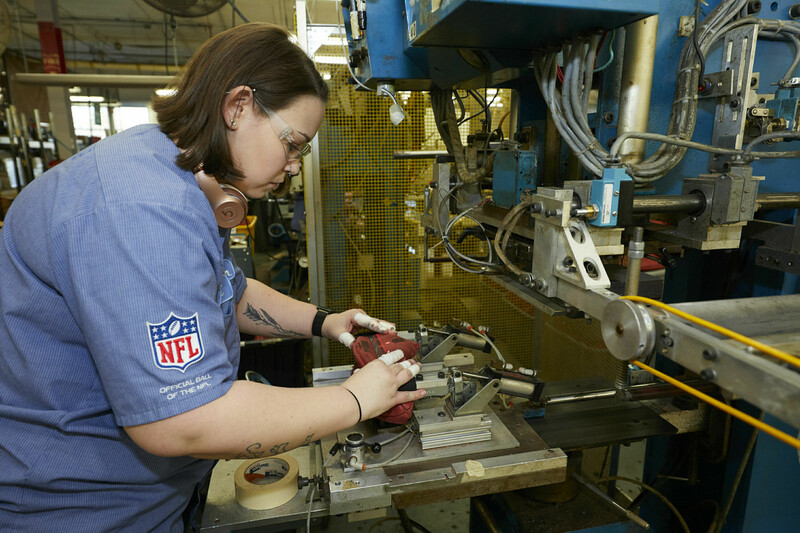 The Los Angeles Rams will play the New England Patriots in Super Bowl LIII on Feb. 3, in Atlanta, Ga.
Katie Long sews the panels of an official football for the NFL Super Bowl LIII game at the Wilson Sporting Goods Co. in Ada, Ohio, Monday, Jan. 21, 2019. The Los Angeles Rams will play the New England Patriots in Super Bowl LIII on Feb. 3, in Atlanta. Bins of official footballs for the NFL Super Bowl LIII game wait to be finished at the Wilson Sporting Goods Co. in Ada, Ohio, Monday, Jan. 21, 2019. The Los Angeles Rams will play the New England Patriots in Super Bowl LIII on Feb. 3 in Atlanta. A bin of official balls for the NFL Super Bowl LIII football game wait to be finished at the Wilson Sporting Goods Co. in Ada, Ohio, Monday, Jan. 21, 2019. The Los Angeles Rams will play the New England Patriots in Super Bowl LIII on Feb. 3 in Atlanta..
Official footballs for the NFL Super Bowl LIII game wait in a bin to be finished at the Wilson Sporting Goods Co. in Ada, Ohio, Monday, Jan. 21, 2019. The Los Angeles Rams will play the New England Patriots in Super Bowl LIII on Feb. 3, in Atlanta. Robin Black inspects an official football for the NFL Super Bowl LIII game at the Wilson Sporting Goods Co. in Ada, Ohio, Monday, Jan. 21, 2019. The Los Angeles Rams will play the New England Patriots in Super Bowl LIII on Feb. 3 in Atlanta. Donna Putnam places a New England Patriots logo on an official football for the NFL Super Bowl LIII game at the Wilson Sporting Goods Co. in Ada, Ohio, Monday, Jan. 21, 2019. The Los Angeles Rams will play the New England Patriots in Super Bowl LIII on Feb. 3, in Atlanta. Donna Putnam brushes an official football for the NFL Super Bowl LIII game at the Wilson Sporting Goods Co. in Ada, Ohio, Monday, Jan. 21, 2019. The Los Angeles Rams will play the New England Patriots in Super Bowl LIII on Feb. 3 in Atlanta. Donna Putnam places a Los Angeles Rams logo on an official football for the NFL Super Bowl LIII game at the Wilson Sporting Goods Co. in Ada, Ohio, Monday, Jan. 21, 2019. The Los Angeles Rams will play the New England Patriots in Super Bowl LIII on Feb. 3 in Atlanta. A detailed view of official balls for the NFL Super Bowl LIII football game that was made at the Wilson Sporting Goods Co. in Ada, Ohio, Monday, Jan. 21, 2019. The Los Angeles Rams will play the New England Patriots in the Super Bowl LIII on Feb. 3 in Atlanta.